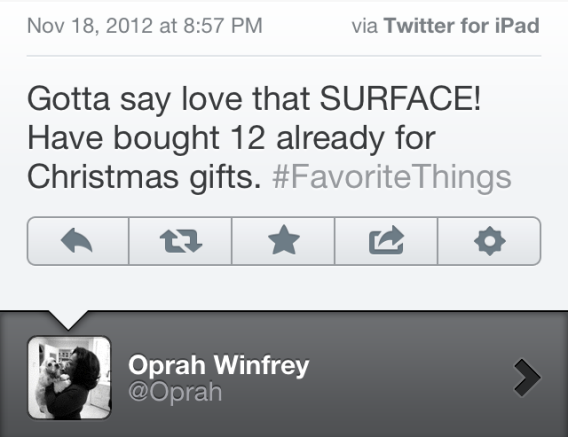 Oops: Oprah uses Apple iPad to tweet her love for Microsoft Surface. Microsoft hopes Oprah’s fans will do as she says, not as she does. Microsoft is pulling out all the stops to promote its new Surface tablet as a worthy alternative to the iPad. The company is rumored to have dropped $400 million on its marketing campaign for the device. But here’s one stop it’s probably wishing it hadn’t pulled out: getting Oprah to tout the device on her Twitter account. The image above shows how the majority of Oprah’s 14.9 million Twitter followers probably saw her tweet, which she dashed off on Sunday night. Looks great, right? Some 370 people have retweeted it, and another 127 marked it as a “favorite.” If Oprah can do for a tablet anything like what she can do for a book, Microsoft should see some nice sales this holiday season. There’s just one problem. As you can see below, some Twitter clients display additional metadata, like what kind of device the tweeter is using. And as Zagg, The Next Web, and others noticed, Oprah—or whoever was tweeting on Oprah’s behalf—was tweeting from an iPad. The giveaway is in the top right corner. There are three plausible ways this could have happened, and none reflects particularly flatteringly on the parties involved. 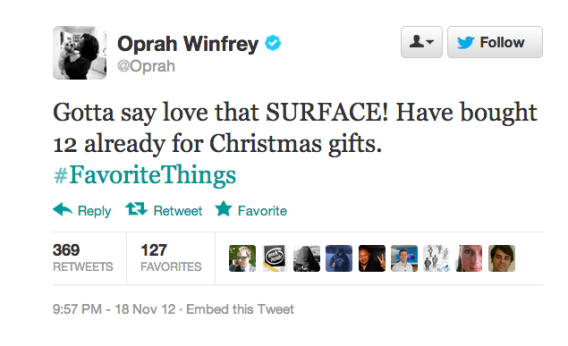 One is that Oprah gets paid to shill for the Surface but actually prefers the iPad. Another is that it isn’t actually Oprah tweeting from Oprah’s account, and her secret surrogate prefers the iPad. The third is that Oprah does in fact love the Surface, but is forced to tweet from her iPad because the Surface lacks an official Twitter client. That last one might sound like the least-damaging possibility. But even that is embarrassing for Microsoft, as TechCrunch points out, because it highlights the fact that major app developers like Twitter have not exactly been making the Surface a top priority. So Oprah’s 12 friends who are getting Surfaces for Christmas—assuming they really exist—will need to download a third-party app like Tweetro or MetroTwit if they want to tweet their appreciation.